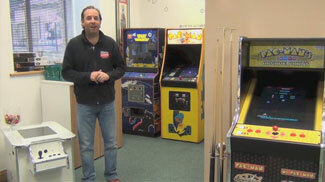 The latest brand new arcade games from legendary manufacturer Namco. Lowest prices guaranteed, free delivery, backed by award winning service. Namco were founded in 1955 as Nakamura Manufacturing, but soon renamed themselves as "Nakamura Amusement Machine Manufacturing Company", which gives rise to the acronym "NAMCO". Since then, new Namco arcade machines have gone on to become some of the best-loved arcade games of all time, including Pac-Man, Galaga, Time Crisis and the Tekken series. We are proud to be suppliers of new Namco arcade machines, which represent the culmination of five decades of experience in gaming and arcade magic. These brand new arcade games from Namco are proof that Namco are still making some of the most incredible arcade machines today, using the most up-to-date technology available and giving you gaming experiences that simply can't be replicated on a home console. Namco still makes some old favourites too, though with modern technological updates and hardware. The series of Pac-Man's Pixel Bash machines feature not only the original Pac-Man game but also 30 other Namco classics, such as Rolling Thunder, Mappy and Galaga. These amazing machines are a must for fans of retro arcade machines and new ones alike, and are available in both coin-op and freeplay upright versions. Namco are quite simply masters of the art of making arcade machines, with one of the longest pedigrees in the industry today. There simply is no substitute for a brand new arcade machine, whether you're running a public arcade or just want the very best for your home. When you buy a new Namco arcade machine from Home Leisure Direct, you know that you're getting an unparalleled arcade experience from the best manufacturer and the best retailer. We stock a wide range of your favourite arcade games in various different styles of arcade cabinets. Click on the links below for more information.